Very nice, I miss having a "L" shaped desk! You are getting close to the perfect setup especially with multiple machine sharing. 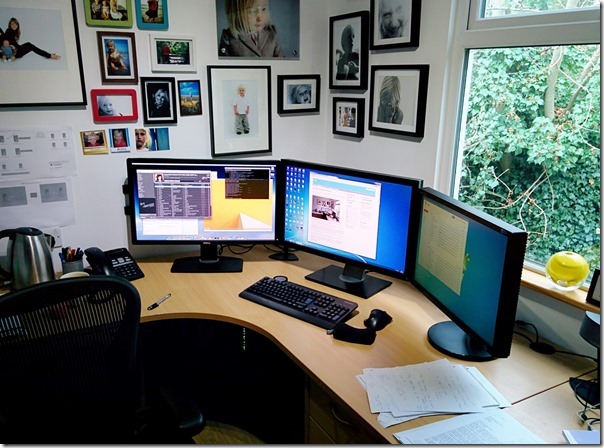 Very nice, I miss having an "L" shaped desk! You are getting close to the perfect setup especially with multiple machine sharing. I second the arms. Make sure the monitors you buy have VESA brackets. There are a lot more photos on the wall than at the very beginning! Also - thanks for the Synergy tip, I used a similar app a while back but it just did mouse, not keyboard too and it was a bit flakey so I gave up with it. I just downloaded Synergy and got it running on my 2-machine setup and wow. I now have twice the desk space!